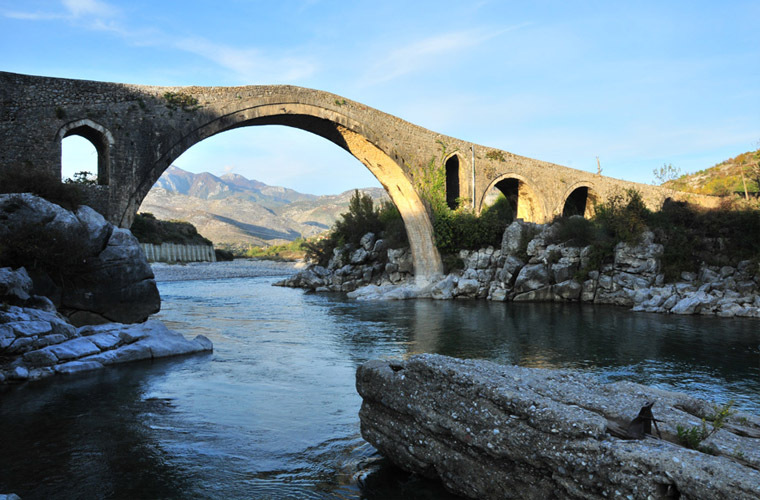 Mes Bridge is a bridge in the village of Mes, about 5 km north-east of Shkodër, in northwestern Albania. It is a monument of Postribs culture, turning the site into a tourist attraction with a lot of visitors from all around the world. For foreigners the architecture of the bridge is intriguing with round slick stones and stone plates. The surrounding panorama gives the bridge an even more picturesque view. Tourists could step on the bridge and watch it closely. It was built in the 18th century, around 1770, by Kara Mahmud Bushati, the local Ottoman pasha,and spans the Kir River.